It's May, and what better way to celebrate the beginning of a new month than with the beginning of a new readalong! Woohoo!! 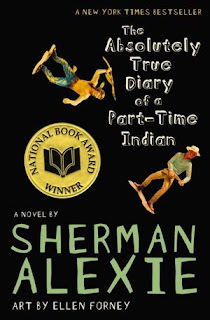 This month, we will be reading THE ABSOLUTELY TRUE DIARY OF A PART-TIME INDIAN by Sherman Alexie. Before I get to the schedule, let me share the description of the book courtesy of Goodreads . . . 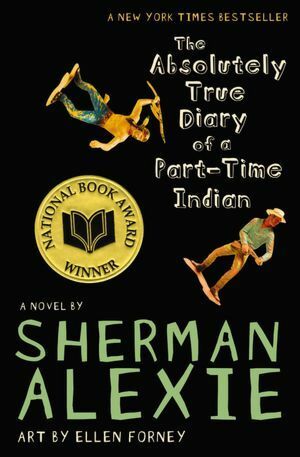 I believe this will be a fairly quick read, but I want us to take it slow and really appreciate the work of Alexie. Therefore, we will be breaking the book up throughout the entire month. If you cannot resist and must read on, feel free to do so. Just be cautious of sharing spoilers within our conversations here on the blog based upon the selected readings. Now, for the schedule . . . In this book, the chapters are not numbered; therefore, the chapters listed are what we will read TO each week. Once you get to the chapter noted, STOP reading (if you can) and join in the conversation. Grab your copy of THE ABSOLUTELY TRUE DIARY OF A PART-TIME INDIAN, and come join in the reading fun!